I am well overdue a few finished project posts. 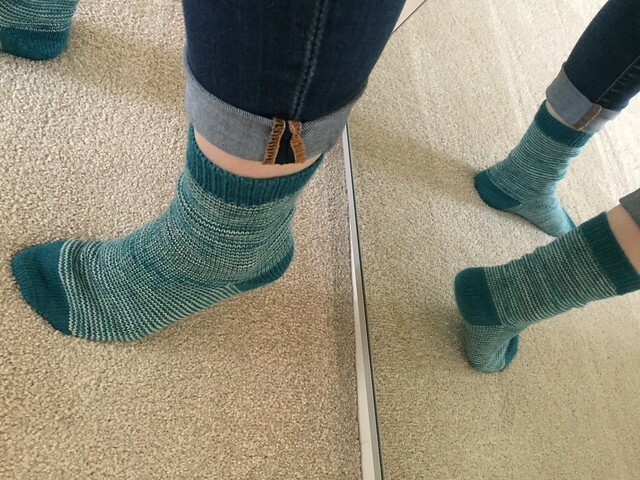 Here is an easy one – my immensely fun, enormously satisfying, reminders-of-Canada Helical socks. Nothing very fancy about these, but the helical stripes were a new technique to me. I can’t explain why it’s so satisfying knitting stripes like this but it just is. There are various online tutorials which make helical stripes sound more complicated than they are, but basically all you’re doing is constantly chasing one stripe with another one (which is why they’re also known as barberpole stripes). 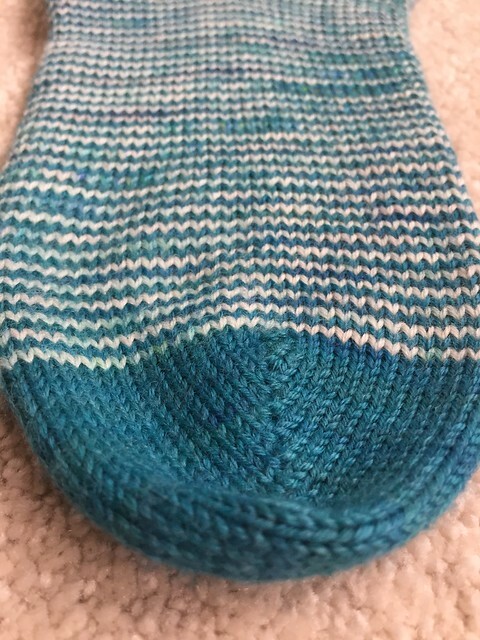 In my case, with my preference for working with DPNs (I like to use five at a time – so stitches are divided over four DPNs, and the fifth one is used to knit the stitches with), once I’d hit the body of the sock I added in the contrast colour and knitted three needles’ worth. Then dropped that colour (still attached! ), went back to needle one and knitted two needles’ worth of the main colour. Back to where the CC ended up, and did two needles’ work of that one. Back to MC and knitted two needles’ worth of that colour. Repeat ad nauseum. 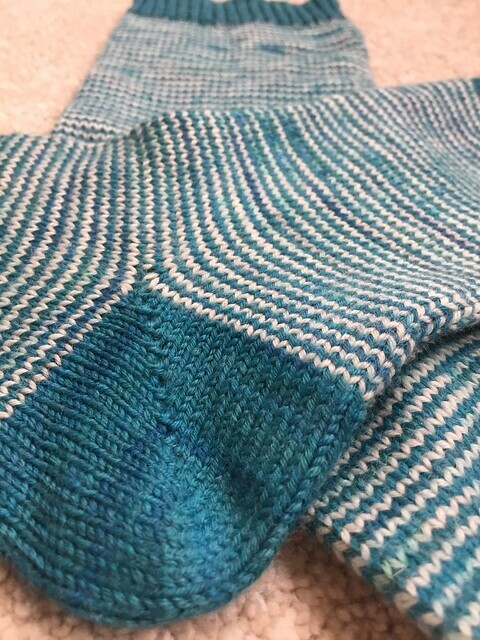 End result – single-stitch width stripes with no jogs. These were also my first short-row toes in a while. 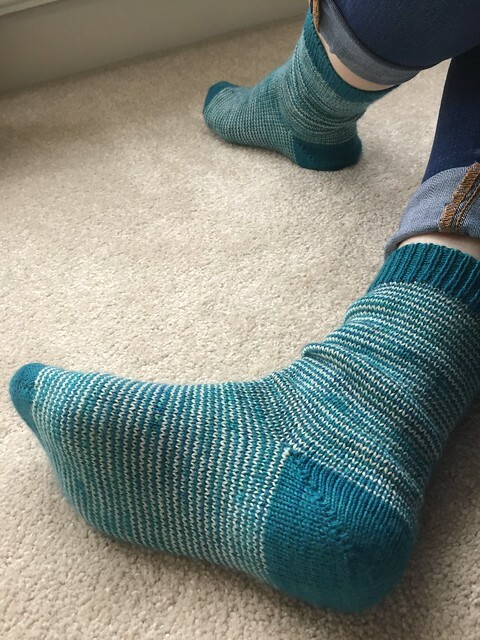 I do love this style of toe – they’re so neat and, well, socky. Overall these socks have a lot of happy memories (most of them Canada), and also some bittersweet ones (I finished them as my Mum was in hospital following major surgery). Such is the way of things with knitting though, and it’s one of the magical things about it – you pick up an item you’ve made and get flashbacks to the various places you visited when you were creating it. 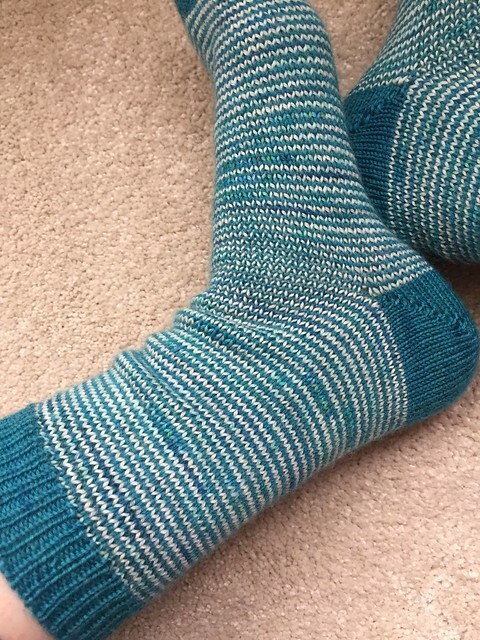 I did my preferred sewn bind-off for k1p1 rib at the end of the cuff, which is another touch that I think makes toe-up socks look especially professional. A little confession though – I managed to not leave myself enough yarn on both cuffs. Don’t look too closely or you’ll see the little bulge which shows where I had to spit-splice in some emergency yarn. (Twice.) Sigh. Great socks!! I’ve been wanting to try helical stripes. I think I’ll try your method:) Thanks for sharing! Thank you, and you’re very welcome – I hope you enjoy doing stripes as much as I did! I love them! Oh boy do my eyeballs feel like they’re spinning around and around. Hahaha! It’s such an ace technique.